Why won't Trump stand up to Putin? As Donald Trump said: "Strange things happen in life." Yes -- like him! Take that strange bromance he's got going with his presidential counterpart, Vladimir Putin. The two recently had a private tete-a-tete, after which our president said that Russia's president had vehemently denied the findings of US intelligence agencies that Putin's hackers and tricksters ran a slew of fake news ads in our media outlets last year to help defeat Hillary Clinton. Trump said that Putin said "he absolutely did not meddle in our election." Well, gosh, I guess Putin would deny that, wouldn't he? But Trump really, really wants to believe that his bro wouldn't fib to him. "We seem to have a very good feeling for each other," Donald said sweetly. "I believe that when [Putin] tells me that, he means it. I believe that he feels he and Russia did not meddle in the election." "Feels?" Putin is a former KGB espionage agent, a practiced liar, and a conniving authoritarian who rules with an iron fist. He doesn't govern by his feelings, but his "feelers" -- loyal operatives who make sure he knows everything that's going on. And he certainly knows that Russia did indeed mess with America's most sacred democratic principle: Free and fair elections. Moreover, he knows that by duping Donald, he's free to keep messing with our internal affairs. Trump has zero knowledge, experience, or skills in foreign policy, and he's in way over his head when dealing with someone like Putin. Why wouldn't our president at least challenge this dangerous foreign threat to our people's democracy? "Well, look," Trump meekly replied when asked this question, "I can't stand there and argue with him." Really? 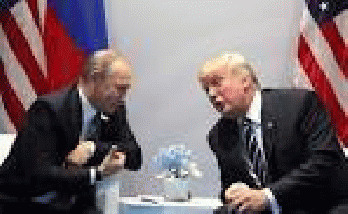 Well since you're not up to the job, please get out of the way so we can find a president who can stand there and argue with the Putins of the World. "Trump says Putin sincere, rips ex-U.S. intelligence heads," Austin American Statesman, November 12, 2017.